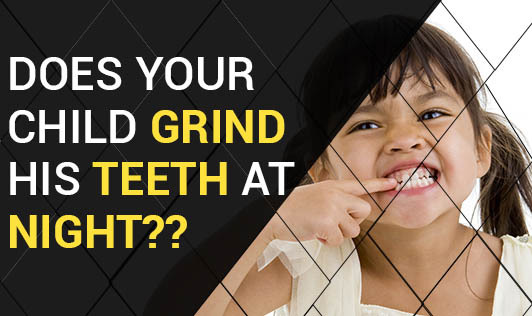 Does your child grind his teeth at night?? I woke up one night to the sound of my nephew's grinding teeth!! "Bruxism" is the term used to describe this medical condition. It has been classified to be a sleep disorder as it disrupts sleeping patterns in many children and adults. Here is a piece of information you should know about bruxism. 1. Bruxism has been reported in about 20% of children up to the age of 11 years and in some adults too. 2. It is seen in children with breathing problems, dental occlusion, psychological and behavioural problems. 3. Children with airway obstruction tend to pull the jaw forward to mechanically keep the airway open. This action may lead to bruxism. 4. An interesting study linked bruxism to maternal depression where mothers with psychological issues complained of their children grinding their teeth at night. 5. Children with bruxism had symptoms of anxiety, stress, depression and hyperactivity. 6. Adults with sleeping disorders like snoring, OSA and sleep talking have an increased risk to develop Bruxism. 7. Stressful, unhealthy lifestyles coupled with increased smoking and alcohol consumption can add to the causes in adults. Long-term effects include wearing of teeth if left unnoticed for a long time. 1. Behavioural approach: Some studies show that psychoanalysis, progressive relaxation, meditation, self-monitoring, sleep hygiene and habit reversal can help in managing bruxism. This approach however, has not been very successful as compared to the other mechanical methods. 2. Mechanical approach: Occlusal splints and Mouth guards reduce grinding noise, reduces jaw muscle activity and protects the teeth from premature wearing. They are designed to keep the two jaws apart and hence prevent grinding of the teeth. You now know what to do when your child grinds his teeth at night. Look for the possible signs in your child and identify the cause of bruxism at an early age.